The Battle for Azeroth Prepatch is finally upon us and with it, plenty of changes are coming to both entice and frighten Brewmasters everywhere! So as not to overwhelm you with too much information, we’ll be breaking down the changes as they pertain to both Brewmaster monks and the game itself in a number of categories here, starting with ability and talent changes. If you’re after something in particular, navigate to it using the sidebar!. Finally, it’s also important to note that as launch approaches, many of these topics will be receiving articles of their own as well, but this page will contain the majority of what you need to know for July 17th/18th. All tank specializations now have a smaller threat bonus of +350%. This post from Wowhead has more details, if you are interested. Damage calculation for nearly every non-caster ability now utilizes weapon dps and attack power. Wowhead also has more information. Orcs can remove their hunch and stand up straight. Blood elves also have access to golden eyes. See your local chiropractor/cosmetologist barber today! Arcane Torrent has been redesigned. It now purges one spell effect from every target in range rather than interrupting and silencing for 3 seconds (2 seconds against players). Every Man For Himself has a 3 minute cooldown and shares a 90 second cooldown with similar effects (up from a 2 minute cooldown and 30 second shared cooldown). Most snares and stuns have been reduced in strength. Many spells and abilities are now on the global cooldown (gcd). 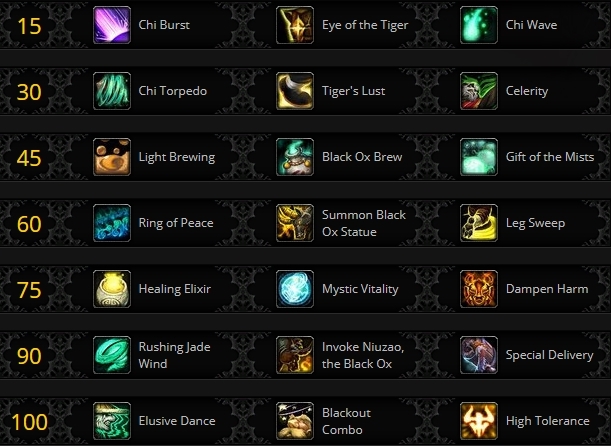 For Brewmaster, only one previous ability is now on the gcd: Invoke Niuzao, the Black Ox. Brewmaster maximum Health has been reduced by 10%. The stat sheet includes a line for current Stagger percent. Ironskin Brew now increases your Stagger percentage by a proportion of your base Stagger. Stagger now affects magic damage at 35% effectiveness (was 40%). Base Stagger on an item level 976 (now 251) Brewmaster. Breath of fire now provides 5% damage reduction against all targets suffering from its damage over time effect (DoT). Breath of Fire‘s DoT now lasts for 12 seconds (was 16 seconds). Breath of Fire no longer grants a stack of Mastery: Elusive Brawler per target hit. Ironskin Brew/Purifying Brew base recharge is 15 seconds (down from 21 seconds). Purifying Brew reduces currently staggered damage by 50% (up from 40%). Effuse has been removed and replaced by Vivify. This is only a name change, nothing more. 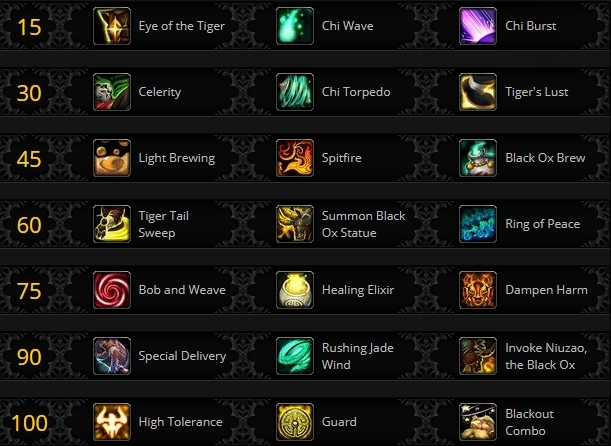 NEW PASSIVE–Mystic Touch—all monk specializations. Any target damaged by a monk will take 5% more physical damage from all sources for the next minute, refreshing every time the monk deals damage to that target. Leg Sweep is now a baseline ability for all monk specializations. Cooldown is 60 seconds and duration is 3 seconds (up from 45/down from 5). Legion’s Brewmaster talent tree. Rows with themes. Battle for Azeroth’s Brewmaster talent tree. Simple/passive on left, more complex on the right. Gift of the Mists removed. NEW TALENT–Spitfire—Tiger Palm has a 25% chance to reset the cooldown on Breath of Fire. Black Ox Brew has a 2 minute cooldown (up from 1.5 minutes). NEW TALENT–Tiger Tail Sweep—Reduce the cooldown on Leg Sweep by 10 seconds and increase its range by 2 yards. NEW TALENT–Bob and Weave—increase the duration of Stagger by 3.0 seconds. This effect is identical to Jewel of the Lost Abbey and both can be used simultaneously. Healing Elixir no longer automatically triggers at 35% health or lower. Invoke Niuzao, the Black Ox is now on the gcd. NEW TALENT–Guard—Gain an absorb shield that prevents damage from going into the Stagger pool as long as the absorb holds. 30 second cooldown, 8 second duration. On global cooldown. Blackout Combo increases the damage of Tiger Palm by 100% (down from 200%) and no longer interacts with Purifying Brew. Guard returns after an absence from Legion. Upon logging in after prepatch, you may find that your artifact doesn’t seem to work the way it used to. In fact, you won’t even be able to cast Exploding Keg! Unfortunately, the power gained from absorbing the energy in Sargeras’ sword has finally caught up with the weapon. As such, all artifact traits are disabled. Relics, however, still increase the item level of the artifact itself, so if you have any higher level relics that had bad traits, now would be a good time to socket them instead! No more Gift of the Ox spheres at 35% hp through Obstinate Determination. No more Hot Blooded (Breath of Fire has damage reduction equal to five ranks baked in). No more Potent Kick (baseline Ironskin Brew duration is equal to two ranks). No more extra Keg Smash range via Smashed. No more passive 30% move speed through Swift as a Coursing River. No more greater Gift of the Ox spheres with Overflow. No more 4 million Tiger Palm crits on Face Palm. No more bonus kegs through Stave Off. No more free purifies with Quick Sip. No more free dodge via Brew-Stache. It’s said you don’t know what you’ve got until it’s gone, and many of these traits will be sorely missed. Don’t forget that a number of these traits also gave Brewmaster increased brew generation, though a few of the ability changes help to offset their loss. Error 801: Fu’Zan not found. As part of Battle for Azeroth’s feature list, Blizzard is once again performing a stat squish much like the one in Warlords of Draenor. However, this time item levels are also being squished. In general, many items are having their item level reduced by roughly 75%. That being said, during the prepatch secondary stats will be largely unaffected; at worst, players will likely lose about one to two percent on the secondaries they had before prepatch. The more of one secondary accumulated before prepatch, the greater the gap will be. For some perspective, an item level 1000 legendary item before July 17th will become item level 265. Legendary items are also still fully usable until players reach level 116. In the case of legendary effects that were also turned into talents, the two effects will stack; for Brewmaster, this means that Jewel of the Lost Abbey and the new talent Bob and Weave will result in a Stagger duration of 16 seconds instead of 10. On top of that, the legendary Soul of the Grandmaster now provides the talent High Tolerance instead of the removed Mystic Vitality. This means that players can (again, until level 116 is reached) play with High tolerance and Blackout Combo or Guard simultaneously. A Legiondary post-squish. They STILL work! Finally, as a minor bonus to players that stuck around long enough in Antorus, the Burning Throne, item level 1000 Pantheon trinkets will be item level 280, 15 item levels higher than legendaries! Once the prepatch arrives, players will no longer be able to obtain Cutting Edge: Argus the Unmaker, The Chosen, A Challenging Look, Fighting with Style: Challenging, or Field Medic. This does not mean that most of the Legion raid titles (the Dreamer, the Darkener, Titanslayer) are off limits, as they are instead tied to the Mythic boss kill achievements rather than their time-gated ones. In addition, Legion’s Mythic raid mounts–Hellfire Infernal and Shackled Ur’zul–will still have a 100% drop rate of one per kill until the expansion itself launches on August 13th/14th. However, guild master looter is being removed as a loot option in raids. Instead, all loot will now be personal only. In the case of mounts, one mount will be given to a single player in the raid group that does not already have it. As another part of this change, a new loot style known as Legacy is being introduced. When entering a raid that the player is more than 10 levels above the expected range, they will see this message. While legacy loot rules are active, bosses will instead drop items as if 5 players were present in a dungeon or 20 players were present in a raid. That being said, the items received will not necessarily be usable by the character like they would be under personal loot. Overall, this new loot mode should help out players farming old dungeons and raids for transmogs or mounts. With so many tweaks to abilities and talents, you might think that there are some significantly different ways to play Brewmaster now. But, while new options like Spitfire and Guard might enable different strategies in the long-run, for now things are staying more or less the same. If you’d like a refresher on how Brewmaster should be played at the moment, feel free to look into our guide, already updated for 8.0! One of the less-discussed features in the Battle for Azeroth prepatch is an interesting new development in the world of player versus player content taking the form of War Mode. What this opt-in mode provides is simple: 10% more rewards from world quests and 10% more experience while leveling. The downside? You are always phased into shards with other players that have this mode enabled and are free to attack and be attacked. On top of this, players with War Mode enabled have access to honor talents in the open world. If you so desire, you could, for example, enable War Mode and have access to the power of Incendiary breath while wearing your Sal’salabim’s Lost Tunic (or using Spitfire!) for every world quest instead of just warden towers and other pvp quests. Unwilling to take on the risk? Simply disable War Mode at Orgrimmar or Stormwind and you won’t be phased with anyone that has it active, even if you are on a PvP realm. A word of caution though: if using group finder, you have no way of knowing who does or doesn’t have this mode active and could be unable to interact with some or even all of your group members. With every prepatch comes a time of massive change. What was current just a week ago has suddenly become old content that no longer seems properly balanced. Players don’t feel pressured to care as much and there are pre-expansion events to do instead of raid progression or PvP rankings to push for. So take advantage of this special time before Battle for Azeroth launches to experiment on your own with different talent setups. Maybe you’d want to experiment with Guard on Varimathras (hint: PLEASE DO), or maybe you’d like to see how Light Brewing compares against Black Ox Brew once more. If you’re feeling especially brave, you might even try playing with Spitfire or take up Special Delivery again–it still snares for 50% compared to Keg Smash‘s 20%–though please don’t make things too tough for those around you. Above all, use this time to get ready for what’s to come, and remember, there is plenty of content waiting to help give your specialization new purpose that you just might not have access to yet.